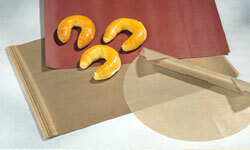 Baking Cloths provide the perfect alternative to silicone paper. Manufactured from fibre glass cloth with a PTFE non stick coating on both sides, available in 30" x 18" or 600 x 400mm sheets or cut specially to size. Wide range of thicknesses, long lasting, easy clean, tear-proof. The perfect solution for those 'sticky' problems.